Points Needed: 15600 Software is not compatible with mobile and tablet devices. Please add this title to your Wish List and sign on to your the first club account from a desktop computer to complete your redemption. ABOUT PRODUCT AVS Video Converter is one of the best and the fastest converters you can find on the web. All key formats are supported: DVD, AVI, MP4, WMV, MOV, VOB, MPG, MPEG, Blu-ray, TS, MKV, FLV, WebM, AMV, SWF, etc. including HD-recordings: MTS/M2TS, AVCHD, TOD, MOD, HDV, etc. Use ready presets and convert video for various devices such as iPhone, iPad, Samsung Galaxy, Sony PSP, iPod,… Blackberry, mobile phones with Android OS and others. 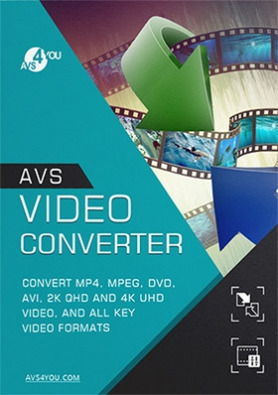 AVS Video Converter converts not only a wide range of video formats, but also lets you perform basic video editing tasks such as cut, trim, merge, export audio and image, apply various audio and video effects. Correct video aspect, edit subtitles and preview results before video conversion. Thanks to Batch mode option you can save your time converting several video files at one go. Choose between specially designed menus and burn files on to DVD/Blu-ray discs. You can share newly-made videos in social networks uploading them directly to popular web-hostings from the program interface. AVS Video Converter is a part of the AVS4YOU.com package. Buy AVS Video Converter and get 10 AVS4YOU multimedia programs as a gift. AVS4YOU tools let you easily convert and edit audio/video/image/document files, burn DVDs, create ringtones, upload videos to portable devices, players, phones and much more! TECHNICAL DATA Windows 10, 8.1, 8, 7, XP, 2003, Vista (no Mac OS/Linux support)	Minimum System Requirements Processor: Intel / AMD compatible at 1.86 GHz or higher RAM: 1 GB or higher Sound: Windows compatible sound card Windows Media Player 11 or higher for WMV video playback Apple iTunes installed to upload to iPod touch, iPhone & iPhone 3G DirectX: Microsoft DirectX 9.0c or later Administrative permissions for program installation and activation Internet connection to activate Recommended System Requirements	Processor: AMD / Intel Core 2 Duo compatible at 2.4 GHz or higher RAM: 2 GB or higher Video: Windows 10/Windows 8.x/Windows 7 compatible video card Sound: Windows 10/Windows 8.x/Windows 7 compatible sound card Note: System requirements may differ depending on the Windows 10/Windows 8.x/Windows 7 version installed and increase when Windows Aero interface is enabled.